The city of Fatehpur Sikri served as the capital of the Mughal Empire between 1570 and 1586. But as abruptly as it had been built, it was abandoned due to the scarcity of water. A popular legend is attached to the city's conception. According to it, Emperor Akbar was without a male heir, and was granted one by the blessings of the Sufi saint Sheikh Salim Chisti. In honor of the saint, Akbar named the prince Salim, and decided to found a new city to celebrate his birth. And thus, the magnificent Fatehpur Sikri, the new capital, came into being. The city was intended to embody the noble ideals, and the humanitarian bent of this dynamic emperor. The finest monuments within this area are the Diwan - i - Am, Diwan - i - Khas, Jama Masjid, Panch Mahal, Buland Darwaza and the tomb of Saint Sheikh Salim Chisti. Speaking of the Jama Masjid inside the Fatehpur Sikri, it is one of the finest mosque you would come across. It is also known as the Dargah Mosque. The most striking feature of its structure is its entrance gate, which is named the Buland Darwaza or the “Victory Gate”. It was built to commemorate Akbar’s victory in Gujarath. Within the premises of Jama Masjid, there is a tomb built for the Shaikh Salim Chisti, the very saint who blessed Akbar with a boy child. Today childless women flock to this tomb and tie a thread to the Jalis, seeking blessings from saint for child boon. The Diwan-i-Khas and the Diwan-i-am are other admiring features of the Fatehpur Sikri. Akbar used the Diwan-i-Khas as the hall of private audiences and the Diwan-i-am was used as the hall of public audiences. The Panch Mahal, a 5-storeyed gorgeous pavilion, was used by the court ladies back then. 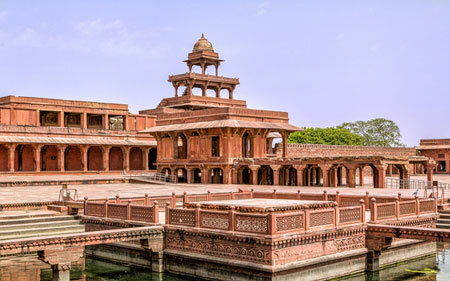 It is again one of major attractions at Fatehpur Sikri along with the Jodh Bai Palace and the Birbal Bhavan.